The Global Partnership to End Violence Against Children has been formed to build political will, accelerate action and strengthen collaboration among governmental, non-governmental and UN institutions for the Sustainable Development Goal 16.2. In line with this and the SDG’s objectives, major child protection organisations including Plan International, World Vision, SOS Children’s Villages, Save the Children, ChildFund and Terre des hommes have started a “Joining Forces Process” in order to identify the actions these organisations intend to implement together to accelerate progress towards the achievement of the SDGs for children. These organisations have agreed to work together under the initiative called "Plan Z" to establish ‘child-led innovation labs’ in countries across the world and empower children to think of and implement social innovations to reduce violence against children. Thus far, Sri Lanka, El Salvador, Uganda, and Romania have been selected as countries. Romania is one of the pathfinder countries under the Global Partnership to end Violence against Children, and four of the six partner organizations are present in the country (WV, StC, SOS and Tdh). This project will support the piloting of the child-led innovation lab in Romania. In line with the notion that children are very creative, the project seeks to involve children, build their capacities and agency and tap into their "out-of-the-box" thinking. Through their direct and active involvement, children can directly influence what directions the changes will take - which should benefit them the most. The project will allow for the mobilization of children and professionals to develop child-centred solutions to key issues related to child protection as well as the opportunity for children to act as ‘lead innovators’ who are empowered to develop ideas and solutions which will benefit a greater number of children. Therefore, on the 9th and 10th of December, in Bucharest, a group of 12 young people (14-18 years old) who are part of the Children & Young People’s Consultative Committees or groups of volunteers of each of the three international organisations present in Romania: Save the Children, Terre des hommes and World Vision, participated in the first workshop of the project. "I confess I did not have expectations from the beginning about this plan, I could not imagine the development of the activities and how those attending the event would be like. I can say that I was speechless. I met new people, people who have ideas, people whom I believe know, can and would change something with regard to violence, school, and mentality of those around them. Everything went smoothly, perfectly, and at the end I was surprised to notice that we could do something that eventually represents a starting point for the project itself. All of us were listened to and we freely expressed our ideas and at the end - we figured out that everything was done with patience and in a team spirit. Only in this way you can truly make it and achieve something!" shared Giorgiana Florentina Harbuzariu. 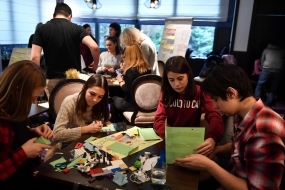 Children were assisted by professionals from 3 Sided Cube (UK), Tdh Romania, World Vision Romania and Lebanon, Save the Children, and the workshop was facilitated by a trainer and coach in Innovation and Design Thinking. During the workshop they addressed best practices and examples of child-led solutions from all over the world, pathways to innovation, explored their perceptions on violence and lessons learnt about it from those around them (families, colleagues, teachers, neighbours, friends, etc.). The workshop enhanced their knowledge for further development of relevant and practical prototypes to improve solutions to end violence against children. Young people came up with three ideas of social innovations to reduce violence against children. They further consult these with their colleagues and friends, and especially with children from disadvantaged backgrounds. This will allow them to prepare for the next meeting, when they will come back with suggestions and improvements. As a result of a debate, one idea will be selected to build a prototype that children will be supported to test in the next months.